As if dozens of wineries, boutique shopping and the views at Enchanted Rock weren&apos;t enough reasons to make a road trip to Fredericksburg this summer, now there&apos;s another mouthwatering excuse to get away! 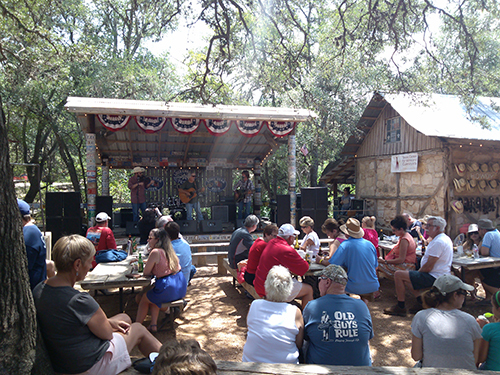 The Hill Country Food Truck Festival in Luckenbach, Texas. Courtesy of A. Koone. Just over an hour west of Austin, discover Luckenbach, Texas complete with a blacksmith shop, post office, beer joint, legendary dance hall and on Saturday, August 1, take part in their 2nd Annual Hill Country Food Truck Festival featuring a dozen hill country food trucks, nine area wineries and a full-day of live Americana music. Prepare your taste buds for bites from Slider Provider (Gourmet Sliders), Cheesy Janes (Burgers), Wheelie Gourmet (Moroccan), Teka Molina (Mexican), Come and Get It Chuck Wagon (Comfort Food), Stouts Pizza, Smoke the Truck (Gourmet BBQ), Chongs (Korean), Kelani Yogurt (also selling Opas sausage), Oh My Heavenly Eats, Saweet Cupcakes, and Clear River Pecan Company (a Fredericksburg favorite featuring ice cream and sweets). Texas wineries will provide you with plenty of award-winning wine pairing options. Take your pick from Lost Draw Cellars, Becker Vineyards, Kerrville Hills Winery, Singing Waters Vineyards, Texas Hills Vineyards, Fiesta Winery, Hye Meadow Winery, Texas Legato Winery and Solaro Winery. Or if beer is more your style, grab a cold one at the Luckenbach Texas bar. With burger and vino in hand, kick back and enjoy some Texas tunes from local artists Ben Beckendorf Band, Tessy Lou & the Shotgun Stars, Adam & Chris Carroll, Midland, Paul Cauthen and more. Festivities kick off at noon and continue until 7:00 p.m. Admission to festival grounds is only $15 and kiddos get in free. Insider tip: skip the line & buy your tickets online!